The poet John Dryden (1631-1700) said something that F M Alexander would have appreciated when he stated that "We first make out habits, then our habits make us". Eminent psychologist William James urged us to be aware of habits before they get fixed - "Could the young but realize how soon they will become mere walking bundles of habits, they would give more heed to their conduct while in the plastic state". We all have habits and many of them tend to be unconscious once fixed, so we are unaware of them and they are indeed 'unseen' by us as Dryden pointed out. It is these unconscious habits that often mean that we mis-use ourselves and our bodies, so that we end up performing tasks in an unthinking, habitual manner, that results in our decveloping aches and pains for instance. These patterns of mis-use can be addressed in Alexander lessons, where we can learn to loosen the bond between a stimulus and our habitual response to it. F M Alexander discovered when he was developing his eponymous technique that it is very hard to let go of our habits, even if they don't serve us, because as soon as anyone has an idea of performing an action they begin "to do the act in the habitual way' because the 'faulty habits feel right'. FM realised that the only way to change the manner in which the act is performed 'means giving up the lifelong habits of use that go with it, and employing in its stead a new use which feels wrong'. In other words, our habits 'feel right' to us, even when we know they do not serve us. 1) "receiving a stimulus to gain a certain end and refusing to react to it, thereby inhibiting the unsatisfactory habits of use associated with his habitual reactions". 2) "of projecting the directions for the new and more satisfactory use in their proper sequence... whilst the teacher at the same time with his hands makes him familiar with the new sensory experiences associated with this new use". The Use of the Self - F M Alexander. This process starts off with aiming to change ourselves during simple activities such as sitting and standing - it's surprising how many habits we all have that interfere with our making such movements simply and smoothly! As the pupil begins to be able to inhibit and give directions, more complicated actions can be explored, such as using a mouse or picking objects up from the floor. 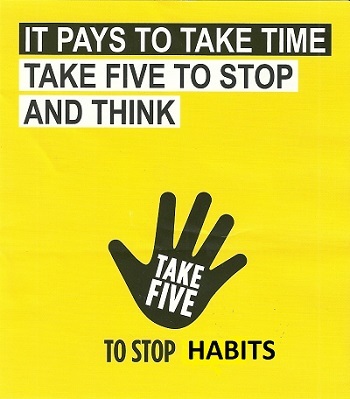 "We can throw away the habits of a lifetime in a few minutes if we use our brains" - Aphorisms ~ F M Alexander. When we say 'no' to our old unhelpful habits of body use and these changes of use are incorporated into our daily lives, we not only lose many aches and pains but we become freer to act through choice rather than just out of our habits. Alexander talked of our mental habits as being "mind grooves" and says that once the mind "is lifted out of the groove" we can "use the old path if we choose (but) we are no longer bound to it". Thanks to the Co-operative bank for the original design which I have adapted!